Last year, at around the same time, 55 highly tuned sports racing cars lined up on the grid for the start of the 78th Le Mans 24-Hour race. Under a bright sky with not threat of rain, the race was run entirely in the dry which made life a little easier for the teams and drivers, but there were more than just a few sore heads on Sunday morning on the banks and in the stands. As a contest the race didn’t develop into the closely run duel that had been predicted, but it did produce some memorable mini-contests throughout the 24 hours. With four Peugeots occupying the first four places on the grid there were no prizes for guessing who was out to win the crowds favour and tighten the psychological screws in the mind games that are so much part of this classic race. Were Audi content to sit back behind the Peugeots in a kind of conservative counter swipe? After all, following the 15:00 start there are still 24 long hours of racing ahead of them and anything could happen – and usually does. 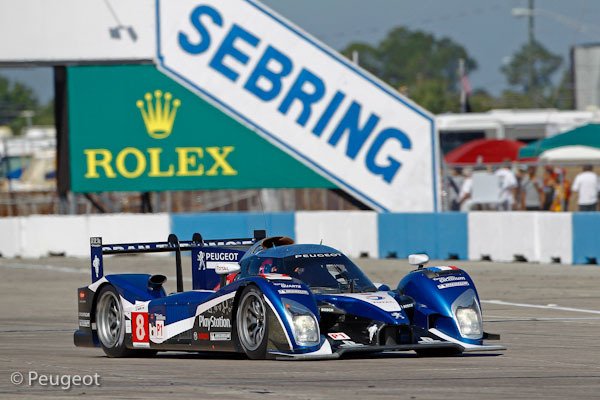 In the LM P1 class there were only two makes in the race, the three works Audi R15s and the three works Peugeot 908s plus the Matmut Peugeot 908. The Peugeots were blindingly quick and Audi had no answer for their outright speed, but it was the reliability of the R15s that saw them take the flag in a 1-2-3 finish. 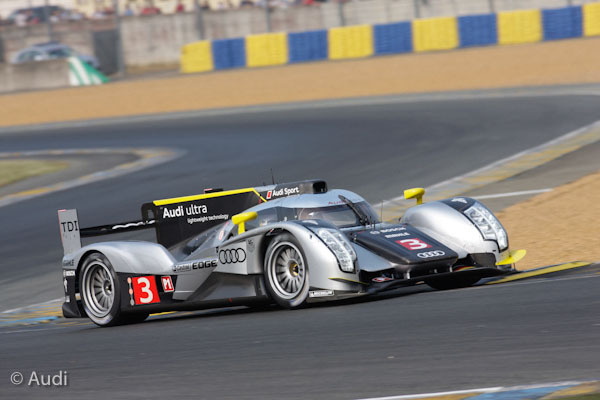 In the LM P2 class, it was the Strakka Racing HPD ARX that took class honours finishing in a fine fifth place overall. The GT1 class was won by the Saleen S7R (13thoverall), but in fact the Porsche 911 GT3 RSR of Lieb/Lietz/Henzler in the GT2 came home ahead of the GT1 Saleen. There were spills aplenty, and the Anthony Davidson works Peugeot tore down on the no.64 Corvette with such ferocity that despite there being no contact, the GT2 car headed straight into the barriers. There was a lot of damage but no injuries, fortunately. The Jaguar XKR RSR (GT2) went out after just four laps with a misfire, and the Beechdean Mansell Ginetta Zytek had an accident on the fourth lap. This year promises to be a humdinger of a race once again. There is not a lot to choose in the LM P1 class as the Peugeots and Audis go head-to-head one more time, but this year is a bit different in that the engine regulations in this class have changed quite radically. Whereas last year the Peugeot 908s ran with a 5.0-litre V12 turbodiesel engine and the Audis with a 590bhp 5.5-litre V10 turbodiesel, this year the Peugeots will be powered by a 3.7-litre V8 turbodiesel pushing out 550bhp while the Audis are to be fitted with a 3.7-litre V6 TDI unit. At the Spa 1000km, often regarded as a dress rehearsal for the Le Mans 24-Hours, the Audis were clearly well ahead of the Peugeots in qualifying, although the cancellation of the qualifying session did have something to do with this. A quick email to a good friend of mine at the track, John Brooks, I asked if the Peugeots were sandbagging it or were the Audis just awesome – “Both,” came the reply. Peugeot won the race, so you can draw your own conclusions there. This is not an entirely accurate picture, due to qualifying session scenario, but this leaves things conveniently up in the air for the 24 Heures du Mans on 11/12 June, 2011.